My favourite event of the school year is fantastic but it always presents a problem: What am I going to wear for World Book Day? For those who don't spend the evening before compiling costumes until the early hours of the morning (props to all the parents out there! ), World Book Day is an annual event in March (this year it's Thursday 5th March) to celebrate reading all over the globe. Children are presented with vouchers for special free books (or £1 off a regular book) and there is a huge celebration in every school, with special book-related events and, of course, fancy dress! You may not already know that I am Queen of Fancy Dress so I always have huge ambitious ideas which, inevitably, all go wrong. 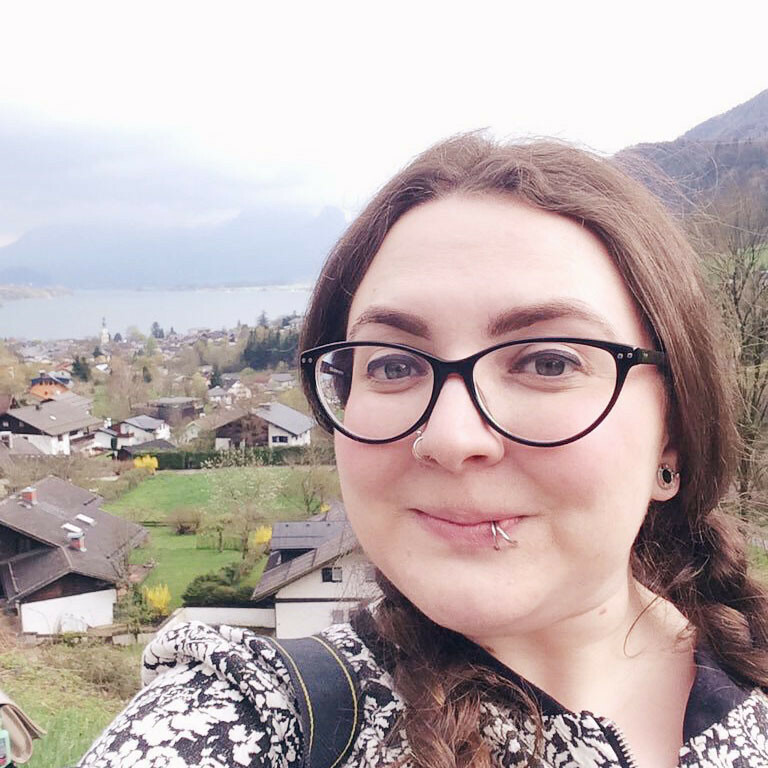 Instead of rushing around trying to sew something spectacular, I've compiled a list of easy peasy, last minute World Book Day costumes with items you probably already have lurking around in your wardrobe. 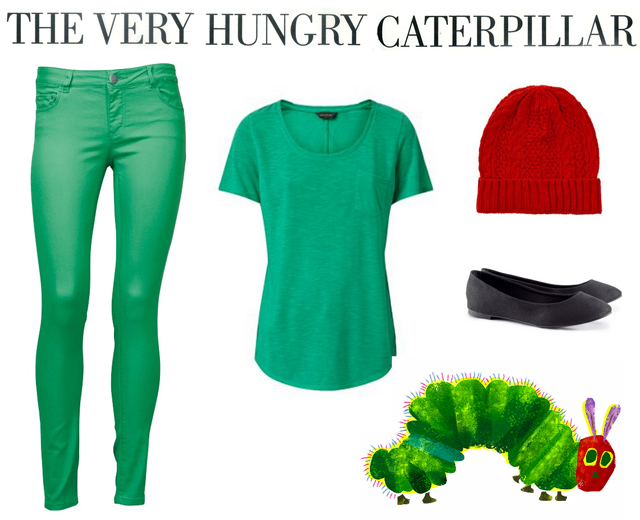 Everybody loves The Very Hungry Caterpillar and the costume is super-simple to put together. Just green everything! Green jeans, leggings, skirt, tops, dresses... Whatever you have to hand. Black shoes for one of your pairs of feets and a red hat for the face. Stick some paper eyes on and you have a caterpillar! 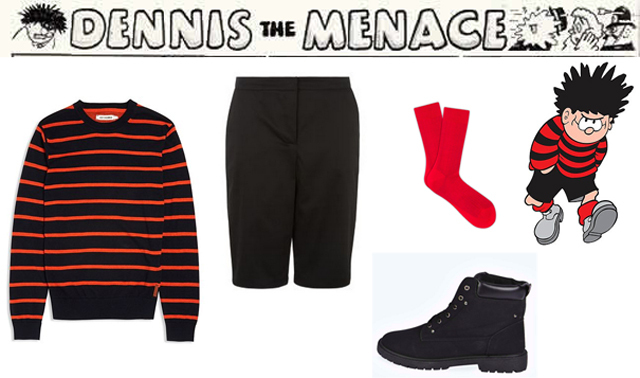 Maybe the rebel look is more your thing, in which case turn to Dennis the Menace. A red and black striped top of some form, teamed with black shorts and red socks poking out of chunky boots is instantly recognisable. This is one I've pulled out of the bag again and again because it's just so easy! The only item that might prove tricky is the apron but you could make one out of an old sheet quite simply. 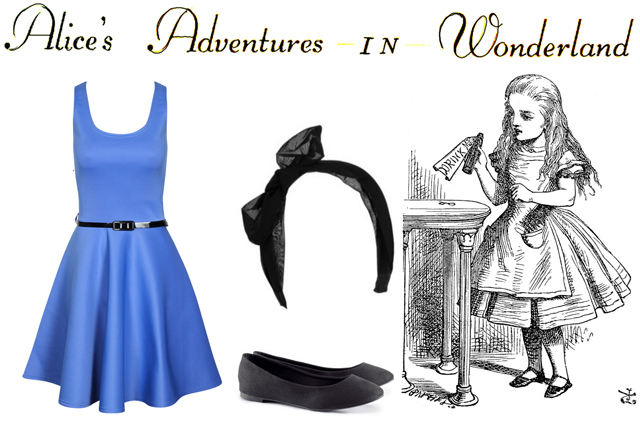 Just team a pale blue dress (and apron if possible) with white tights, black ballet pumps and a black bow in your hair, if you want to go down the slightly more recognisable Disney route. Simple! Whatever you decide to dress yourself- or your kids- up as this year, I would love to know so please do let me know in the comments! Love the Dennis one, i loved him as a kid! The Alice one is something that I need to do. I don't know when but this is happening for sure! Oh blimey, that came up quick! I need to throw together some everyday cosplay, just for the subtle nod towards World Book Day.